Ghillie or gillie is a Scottish dialect term that refers to a man or a boy who acts as an attendant on fishing or a hunting expedition. In origin it referred especially to someone who attended on his employer or guests. A ghillie may also serve as a gamekeeper employed by a landowner to prevent poaching on his lands, control unwelcome predators and monitor the health of the wildlife. The origin of this word dates from the late 16th century, from the Scottish Gaelic gille, "lad, servant", cognate with the Irish gile or gi-olla. Historically, the term was used for a Highland chief's attendant, also sometimes called a Gallowglass if he was also a soldier or guard, but this use became rare before the 20th century. A gilhie-wetfoot, a term now obsolete (a translation of gillie-casfiiuc/s, from the Gaelic cas foot and fliuch wet), was the gillie whose duty it was to carry his master over streams. It became a term of contempt among the Lowlanders for the 'tail' (as his attendants were called) of a Highland chief. Brogues, often called wingtips in the USA, are low-heeled shoes that are made of heavy and untanned leather, said to have originated in Scotland. 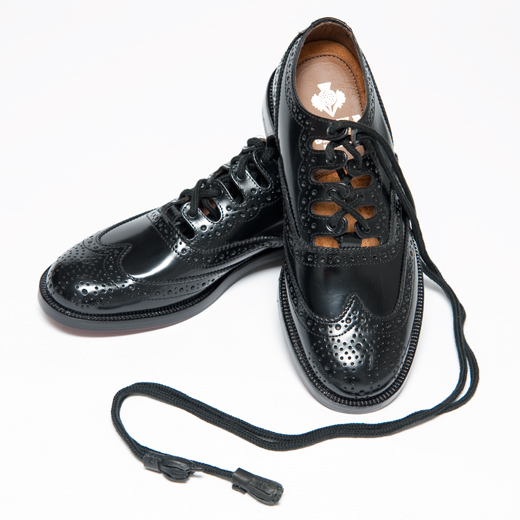 Brogue also refers to Oxford shoes that have fringe or wing tips. The term wingtip derives from the toe cap pattern, which forms a W and resembles the profile of a spread bird wing. The term brogue also survived in American English as the term "Brogans" in the Appalachian and Southern dialects. The word "brogue" is derived from the Scottish and Irish Gaelic word bròg meaning "shoe". The plural ("shoes") is "brògan". Ghillies, or Ghillie Brogues, are a type of shoe with laces along the instep and no tongue, especially those used for Scottish country dancing. Although now worn for dancing and social events, ghillies originated as a shoe that would dry quickly due to the lack of a tongue, and not get stuck in the mud because of their laces above the ankle. Because they are associated with a lad or servant, many Scotsmen will not wear ghillies preferring instead to wear a dress wingtip.